Thank you to all those organisations and individuals who have supported MSC. THE HOLY PROPHET (P.B.U.H.) HAS SAID, “THE INK OF A SCHOLAR’S PEN IS SACRED THAN THE BLOOD OF A MARTYR”. These glorious words throw light on the importance of education for Muslims. Plato once said “If you want to judge the standard of a nation; Judge the standard of its educational institutions and caliber of its teachers’’. It is a great tragedy that we do not pay any attention towards the scientific education of our children. Read More..
To provide quality education to the students to meet the challenges of the modern time. To inculcate a healthy and competitive spirit among the students. To give special emphasis on the moral values and character building of the students. Read More..
» 2002 FSC 10th Position. 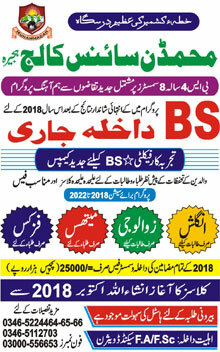 My dear friends, this institution is a ray of hope, helper of helpless people and a beam of light for the achievement of life goal in the pitch dark ness Muhammadan Educational System has taken a practical steps to root out the evils like poverty, illiteracy class distinction, narcotics and environmental pollution through education.... Read More..